While The Legend of Zelda: Skyward Sword didn’t fly off of the shelves as well as other games, it certainly had millions of fans drooling every second over its release. It made its way to the top of the sales charts in both the United States and Japan in November. While it has continued selling well and holding its place here in the west, over in the east it seems to have slid off the charts for video game sales. Japan seems to have its love for the Zelda series just like the rest of us, but it seems their hearts lie with the handheld releases of the series. Phantom Hourglass and Spirit Tracks seemed to have sold well, so what happened with Skyward Sword? The Legend of Zelda: Skyward Sword has completely fallen off the top software sales charts in Japan, selling less than 320,000 copies in its debut holiday month. The Wii game, considered by many as one of Nintendo’s biggest releases for the system, has sold considerably less copies than other recent mainline entries for the long-running Legend of Zelda series, such as Phantom Hourglass and Spirit Tracks. Debuting at the top of Japan’s software charts in late November, Skyward Sword saw its sales drop quickly not long afterward, and it failed to break into the top 20 two weeks ago. Holiday shopping hasn’t generated enough interest to push the game back in this week, either. For comparison, 2009’s The Legend of Zelda: Spirit Tracks sold around 500,000 copies in its first five weeks on Japanese store shelves, while 2007’s Phantom Hourglass moved 631,100 during the same length of time. The Legend of Zelda: Twilight Princess, which accompanied Wii’s 2006 launch, sold somewhere between 280,000-350,000 copies in its first week, but that was too a much smaller Wii userbase, and it was competing with a Twilight Princess SKU for GameCube. 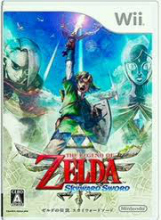 The Legend of Zelda: Skyward Sword has fared much better in the States, where in just the month of November, it sold around 600,000 copies. The Legend of Zelda: Skyward Sword is undoubtedly the biggest release from Nintendo in years. I’ve seen a lot more of a cultural influence in Skyward Sword than I have in past titles, so why is it not selling as well as other games? I would think a game that Nintendo worked this hard on would sell even better in Japan than in America due to all the first person shooter fan boys and graphic junkies that we have. How do you think this will affect Nintendo’s decisions when it comes to future Zelda titles? Will we see more work put into handheld titles or will we see a different approach to the console titles? Although with the next console release being on the Wii U, I doubt it will have any trouble selling no matter what Nintendo does with it. Let us know your thoughts.